"Can I take my drink bottle home" a child asks her mum. Mum replied with "It will be your responsibility to remember to bring it back, do you think you can do that"? "oh yes I will bring it back in the morning" was her determined response. For two days the child agonised over the fact she kept forgetting to bring her drink bottle back. Of course she was given a replacement however it didn't sit well with her at all. Later that night a text message with a photo of the child holding up her drink bottle filled the screen of my iPhone. Child arrived home and was obviously still thinking of her forgotten drink bottle. As the family were all busy doing their evening rituals of homework, cooking dinner and getting ready for the next day, they didn't notice the child had started gathering bits and bobs and putting them on the table; including blu tac off the wall. When mum finally realise there was a growing pile of 'junk' starting to overtake the table she asked what she was doing. 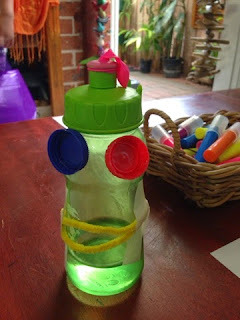 "I'm making my drink bottle into a person so I don't forget it" was the nonchalant reply. The child, using initiative set about solving her dilemma with explicit instructions to her older wiser sisters, that she didn't need any help she was doing it by herself. Sticking bottle tops for eyes and a water balloon to the top for hair she set the next stage in motion. She instructed her older sister to write a note saying 'I will not forget my drink bottle tomorrow' and sat it on the table next to her now embellished bottle. Mum was astounded and took a photo straight away and sent it to me. I wanted to hug the parent. Thankyou, thankyou, thankyou, for giving your child the opportunity to be independent and responsible for herself. Thankyou, thankyou, thankyou for allowing your child to have opportunity to investigate and find a solution to a problem that was obviously causing her so much anguish. Thankyou, thankyou, thankyou for believing that your child is capable of making decisions. The last but most important thankyou is for allowing your child to follow through with her solution. The look on the child and mothers face when they arrived the next morning with 'The Bottle' was priceless. It took pride of place on the table and was admired by all. And I did hug the parent.